The Hereditary Society is a nonprofit Organization for the verification and certification of Heredity and Genealogy for it's members. standards and practices of historical documentation for the collection of family linage. Membership is open to anyone who desires to certify their family historical and DNA records through genealogical documentation, GEDCOM, or book which includes their family tree. The categorical membership is associated to a members professional status or family tree which may include DNA records, Historical documentation, and genealogical records. as published and contained in the public record at Merrick Foundation Org and DNA Samples of the MT DNA and Y DNA certificates published at FTDNA. and his descendants and offspring from 20 children and 4 wives. Which line was featured on "Who Do You Think You Are"
United States. HS SEAL Certification and documentation number 077. DNA gathering and reporting association such as Family Tree DNA is accepted as verification of lineage where samples are present proving ancestry. their family trees. We at HS believe that the educated person finds the sources and can create a documented GEDCOM and DNA record that is present in the World Family Tree. your heraldry and ancestral lineage. The Certification to perform Genealogical documentation in the form of family tree for hire, and grant the HS SEAL to members. Requires having worked in the Genealogical and Historical field for hire for at least 5 years or being a member of this society as a Heredity Ancestry Member for 5 years. 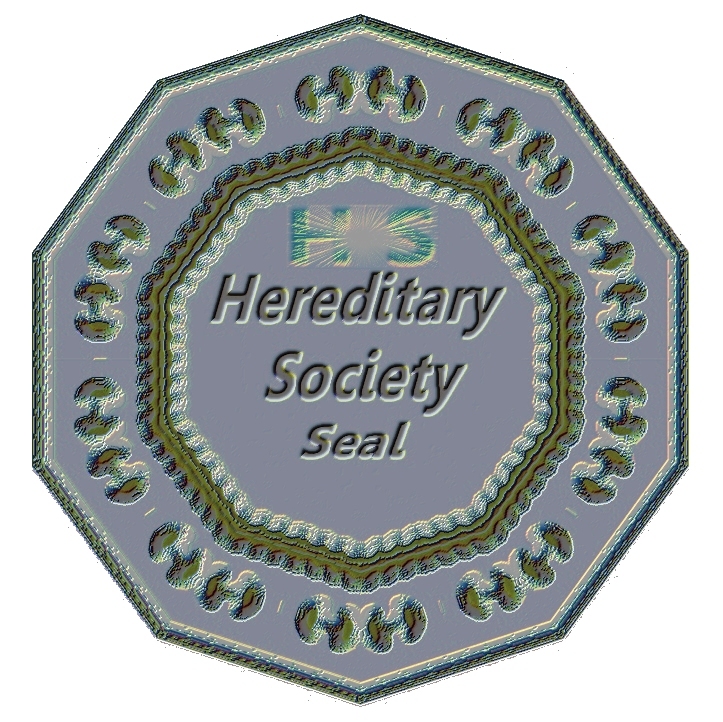 Genealogical Societies may be endorsed under this category at the life member level and display the HS Member Society Seal on their web site or in print. Employees of historical or genealogical societies or foundations are provided with an exemption of the 5 year requirement with proof of employment. At the end of the first 5 year membership as a genealogist member, you pay a one time $102 renewal membership fee for life membership. The Certification of your Heraldry to Royal lines, Immigrant Societies, and DNA. Requires submission of GEDCOM and or DNA proving your lineage to a Heraldry Royal, Society, or Immigrant ancestor for review. have two lines or more to a given line, but the possible routes up the tree may be in doubt, in such cases, an opinion will be given of the proposed or preferred ancestry by documentation. You may display on your publications online or in book the HS Seal of your Genealogy and provide certification of your ancestry with the HS SEAL. The Certification of your Gedcom and Surname line with reference verification endorsing the validity of sources. Herald Members HS SEAL. Requires review of GEDCOM and Sources. The Certification of your Relationship to a line by GEDCOM and records of Birth by Ancestry within the last 10 generations for one surname. Requires birth certificate and records for one surname. 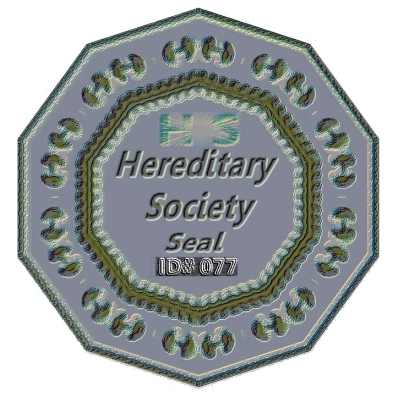 Ancestry Member HS SEAL. certified, then you may request an additional review for publication or update for a one time fee of $25.00 once per year. or in printed format to show verification and validation of sources of your genealogical research and lineage. court houses, libraries, and educational or government sources which evidence that your tree is a true and correct lineage to be accurate by the records. the lineage to codex of surname, but not prove which brother or father was in fact the linier ancestor, which is corrected within 1 or 2 generations in some cases. Many genealogists may omit an ancestor due to questionable or missing sources and HS shall not be held responsible or liable in such cases where no source exists. HS shall make every attempt to validate census records and given sources as being correct or within parameters set by the standards of genealogical practices. 90% by DNA information provided. HS does not do DNA work and recommends FAMILY TREE DNA or other sites to gain DNA for submission to this society. We are a standards and practices organization lending credence to the research and educational standards within the genealogical field. Remove spaces above published this way to prevent spam.